Acoustic enclosure for a ‘Horizontal Balancing Machine’ for a major UK based aerospace manufacturer. To design, manufacture, deliver, install and commission the required acoustic enclosure, this being of approximate overall dimensions 6.5m long x 2.5m wide x 2.2m high. The enclosure to be fit for purpose in providing a safe working environment for operations and maintenance personnel. The unit to be supplied in two pre-assembled halves for positioning about the existing balancing machine and associated ancillary /auxiliary equipment. 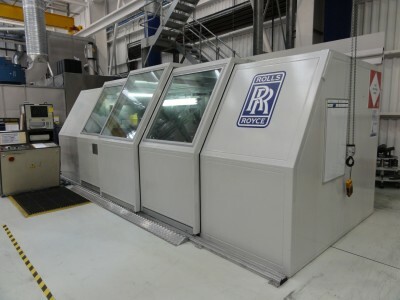 When fully assembled, the enclosure to provide the desired access in the form of bi-parting pneumatically operated, horizontally sliding doors and canopy, giving unhindered access to both the enclosure front and roof over an area approximately 3.7m long, to facilitate operator entry/egress, and the loading and unloading of tooling via an overhead shop crane. Surface mounted floor track arrangement with external rampart and internal aluminium tread-plate decking, offering personnel safe passage in and out of the enclosure without encountering an unacceptable trip hazard. Acoustically insulated vision panels that provide the necessary resistance to internal damage by projectiles, flying debris etc. Inclined vision panel arrangement to further enhance the operators overview of the balancing process. The provision of the necessary electrical fitments to facilitate adequate high frequency lighting suitable for rotating machinery. Integration and mechanical installation of the end users factory standard door interlock equipment. Based solely on a maximum figure of 95dB(A) at 1 metre, the proposed construction rated at 25db satisfied the end users requirements.